There's a sense of unease in the markets Friday as worries resurface over rising tension between Ukraine and Russia. 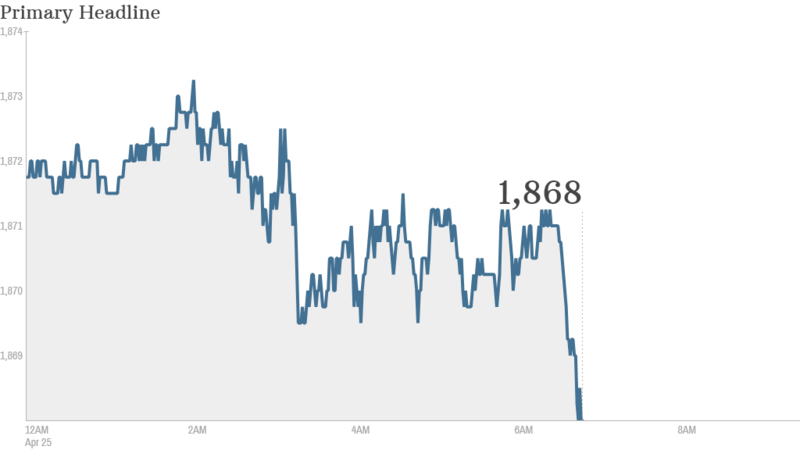 U.S. stock futures were in negative territory ahead of the opening bell. European markets declined in morning trading, with Germany's DAX again taking the biggest hit. Germany is Russia's largest trading partner in Europe. New sanctions would hurt both economies. Senior government officials told CNN that the U.S. could impose new sanctions on Russia as early as Friday for failing to take steps to reduce the tension in eastern Ukraine. Sanctions would target key allies of Russian President Vladimir Putin, high-profile oligarchs and possibly companies. Tensions in Ukraine escalated sharply Thursday, with Russia embarking on new military drills near the border after Ukrainian forces said they killed five pro-Russian militants within their borders. Phil Roth, director of the Market Technicians Association Educational Foundation, said if it weren't for Russia, "we'd be looking for another excuse for a market that's in consolidation anyway." The latest reading on CNNMoney's Fear & Greed index shows sentiment is still languishing in "fear" mode. Meanwhile, quarterly results keep rolling in. Ford (F) shares declined after the automaker reported its first quarterly earnings decline since 2012. Investors are awaiting earnings from Burger King (BKW) and Colgate-Palmolive (CL) ahead of the market open. Shares of Microsoft (MSFT) rose after the company reported first-quarter sales that exceeded analysts' expectations. Amazon (AMZN) reported better-than-expected earnings and revenue. Starbucks (SBUX) reported a gain in sales and earnings. Shares of Visa (V) fell after the credit card giant missed revenue forecasts. In economic news, the University of Michigan's April consumer sentiment index will be published at 9:55 a.m. ET. U.S. indexes drifted between small gains and losses throughout the day Thursday. The Dow Jones industrial average ended flat while the S&P 500 and Nasdaq both posted small gains. Only the S&P 500 is up for the year so far. Asian markets mostly closed with losses Friday. The Hang Seng in Hong Kong dipped by 1.5%, the Shanghai Composite declined by 1%.